Seafood, Seafood and more Seafood! - My friends and I are taking advantage of the amazing seafood here in Boston that we just can't get at home in the midwest. I'll be reviewing the places we visit so stay tuned! 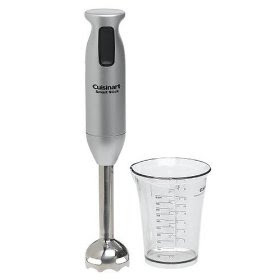 The versatile stick design of the Cuisinart® Smart Stick® Hand Blender lets users blend ingredients right in pots, pitchers, bowls, or the clear plastic beaker that’s included. A powerful 200-watt motor operates with an easy one-touch control. Blends drinks, purées soup, mixes pancake and crêpe batters in seconds! Both stainless steel blending shaft and beaker are dishwasher-safe. Baked Potato!! Which is never as good when I make it at home. Congratulations to Ms. Aliza! 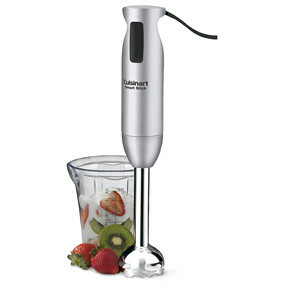 Please email me at [email protected] so I can have the brand new Cuisinart Stick Hand Blender sent to you! Thanks again to all those that commented and stay tuned to the next Foodie Freebie announcement on Monday, October 19, 2009! Don't feel discouraged if you haven't won yet - I have a whole year's worth of freebies ahead and next week is one that you won't want to miss! Congratulations Ms. Aliza! What a great giveaway!